Kath Irvine of Edible Backyard conducted a pruning workshop. We were so overwhelmed by the numbers that came..over 80.. Kath is a wonderful tutor, able to talk visitors through the art of pruning. About not being afraid and understanding that pruning encourages growth. If you want to get Kath’s book??? Early Bird Offers now available! By purchasing an Entertainment Membership with us, you’ll receive 25 to 50% off and 2-for-1 offers to many of the best restaurants, hotels and attractions. Kaiapoi.info is selling brand new 2018/2019 Entertainment™ Memberships as the traditional book and as a digital application that can be used from your smart phone. PLUS, order now to receive over $165 of bonus Early Bird Offers that are valid from now until the 1st June 2018.
connect, nourish, educate and inspire. 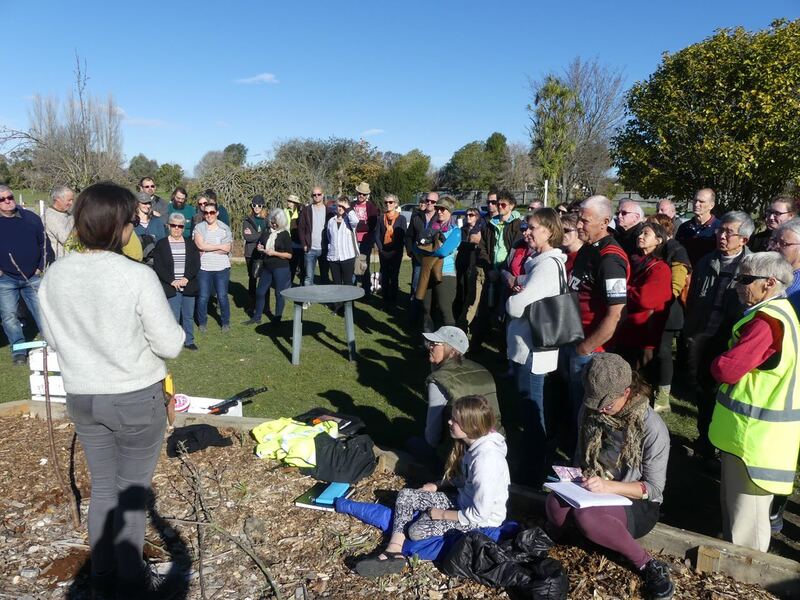 Creating a food forest is an exercise in connecting people, increasing resilience and sustainability, reducing net migration, improving living quality, creating jobs, strengthening mental and physical health, up skilling youth, attracting tourists and generating profit for Kaiapoi and the Waimakariri District. A community food forest provides an abundance of food for residents and those that wish to visit to gather – fruits, vegetables, herbs and medicinal plants by way of a layered permaculture companion planting system. CBK Craft Bar & Kitchen Kaiapoi for providing vouchers and putting together the loyalty program….everytime you visit CBK, if you can mention the food forest when paying the bill, a portion of the profits goes to the food forest. Woodend Nurseries for providing a great deal on the plants and trees. Ouruhia Nursery for donating a Bay tree. Ken Batchelor from Hook Bush Nursery in Waimate for donating many plants and lovely apples. Thank you to all of the families for coming along and special thanks to the entire Smit family for coming along and donated many plants thank you Cassandra Smit, David Ayers and Marilyn, Sanne Susan Mullink-Holland for coming along to help….and all of the others…thank you. Below is a list of some of the plants and trees that are now in the food forest. For those that missed the prizewinner for the Cubby House – the randomly chosen winner, and the most nominated, is…………..the Food Forest Kaiapoi – kai is in our name….well done guys and we will be in touch!!!!!! Location – Corner of Cass and Meadow Streets. Please bring a spade, hat sunscreen, closed in shoes and a picnic. We are wanting to plant over 200 fruit trees and some smaller trees/bushes. You are more than welcome to bring along any edible seedlings, berries, edible plant cuttings, herbs, edible trees. Planting now will mean many of the trees and plants will produce food in the coming spring/summer. We also start planting the Rongoa (Maori medicinal plants) area… this area will be filled with native plants that people would come and forage. Lots of work has been happening over the last 6months..we would like to show you.. ie over 500m3 of mulch has been moved, over 400lm of borders have been installed, we have installed the first seat.. with many more in the planning. At night you will see twinkling lights.. which make the area special. We have more seating ideas..we just need $$$ to make it happen. With schools coming from throughout the Waimakariri and from further afield. This is the first set of seating (Thank you Glenn Foley for helping today) we have used decking from the old wharf for the platform and have bent plywood to create the seating ..the seats comes complete with solar panel power to charge your phone or device. The community was asked what could be done with all of this land. One of the most popular suggestions was to use the land for food forest/community garden, fruit and nut trees in public spaces, a place that enables enjoyable family leisure activities. WDC approached Brent to gather together a group to design and manage the food forest. From there a Trust was formed and a licence to occupy was agreed. What is a food forest. Forest gardening is a low-maintenance sustainable plant-based food production and agroforestry system based on woodland ecosystems, incorporating fruit and nut trees, shrubs, herbs, vines and perennial vegetables. Forests exist fine on their own. There’s no mowing, weeding, spraying, or digging required. No pesticides, fertilisers, herbicides or nasty chemicals. No work and no people either. They somehow do very well. By understanding how forests grow and sustain themselves without human intervention, we can learn from Nature, copy the systems and patterns to model our own forests — ones filled with trees and plants that produce food we can eat. We can design and construct the most sustainable food production systems possible; perfected, refined and cared for by Mother Nature herself. Come to our open day on the 28th January 2018 at 11am – come with your family & friends, bring a picnic. Learn about the food forest, how things are grown, pick some food, experts will be on hand to answer your questions about the trees & plants. Location – corner of Cass and Meadow Streets, Kaiapoi. Wear closed-in shoes or gumboots and bring your own shovel and gloves if you’d like to get hands-on. Please bring along a bundle of newspapers which will be used between the layers of compost and mulch, this will assist in keeping weeds at bay. Bring along a blanket and picnic, or visit one of our wonderful cafes and purchase a coffee and food and bring that along. Establishing a food forest was a popular request during the community consultation phase of developing the Waimakariri Recovery Plan. The WDC and The Kaiapoi Food Forest trust will work together to bring this legacy community project to life, because Kai in is our name. Look forward to seeing you on the 16th September 2017. This will be the first food forest in Waimakariri. This will be a legacy project, providing food for generations. We will grow many heritage varieties of fruit and vegetables. Repurposing fruit trees from the neighbouring red zones, trees going from feeding one family to feeding a community. Today the 28th August and tomorrow we have Treetech moving trees that are growing in the Kaiapoi east red zone to the Kaiapoi Food Forest. Fruit trees go from feeding one family to feed a community. Whilst it is costing $7500 which is coming out of a promised $30K from Council, we think that it is money well spent.. for a number of reasons. The families that moved off their land, leaving behind a wonderful legacy…lots of fruit trees…mature fruit trees. The fruit trees are in areas that in time will be sports fields and in the way…so more than likely would be cut down and mulched. The trees are mature and will provide fruit straight away. The moving of trees will provide a kick start to the food forest, so we can start having students visit and soon after events. Forest gardens are truly incredible things. Forests are like nature’s own version of a permaculture system, being self-sustaining, diverse and productive. By observing and copying nature in this regard, we can utilise the benefits that nature has shown us to create a forest system of our own that is respectful of the earth and provides an abundant harvest. Forest gardens work by aping the layered composition of plant life in a natural forest. Tall trees – such as fruit trees – are the topmost layer, providing the canopy, then plants of different heights and characteristics are planted beneath, from dwarf trees and shrubs to companion plants, vegetable crops, herbs and groundcover. A forest garden can also contain climbing plants that grow up the trunks of the trees. Given the right sort of climatic and topographical conditions, nature will instinctively move towards a forest environment. Different types of plants provide advantages that promote growth of other species in their vicinity, and this has a knock-on effect that includes binary relationships between plants, insects, soil and animals. In nature, plants want to grow and flourish, and they seek to populate environments in which the chances of doing so are maximized – a forest is one of the most fruitful places for this to happen. As a guiding principle of permaculture is to learn the lessons of nature and seek to use that knowledge, copying the structure of a forest in a garden makes perfect sense. One of the primary problems with modern, industrial agricultural methods is the planting of monoculture systems. Growing single crops is detrimental to biodiversity, and creates more vulnerable ecosystems (see more on this below). Permaculture, therefore, promotes the idea of maximising biodiversity in food growing systems. A forest garden is one of the best ways to increase the biodiversity of an agricultural ecosystem. A forest garden offers so many different niches within it that plants can take advantage of, increasing the number and density of plant species within the ecosystem. This abundance of biodiversity has another effect; it provides a large range of different habitats. This in turn attracts a variety of local wildlife, making for a more dynamic environment. The variety of plants will bring many different species of insects to the forest garden (which then pollinate the plants within it, adding to the self-sustaining nature of the garden). This influx then attracts birds and insect-eating reptiles and mammals, which are then food for larger mammals. The variety of vegetation will also attract different types of herbivore, although you can plant your garden in certain ways to minimise the damage by deer, say. One must also remember that, not only does this heightened influx of animals aid the biodiversity of the forest garden, it also gives more opportunity to view wildlife, which is a great pleasure. Linked to the notions of biodiversity and variety of habitat is the concept of resilience. As we know, agricultural systems that have a single crop are highly unstable and precarious. A period of poor weather, a transmissible disease or the invasion of a pest can decimate the crop and the farmer is left with nothing. In a system such as a forest garden, where there are many different species of plants, the whole ecosystem is much more resilient to devastating events. So, even if there is an unexpected event that hits a certain species of plant hard, there are many others in the system that, due to their different chemical or physical composition, can withstand it. This means that you are extremely unlikely to face a barren harvest from a food forest. A mature forest garden gives a large yield of edible foodstuffs. The variety and biodiversity inherent in the design – and with judicious planting – means that crops are available throughout much of the year. Companion planting and the variety of niches and microclimates with a forest garden ecosystem contains result in ideal conditions for plants to thrive, and so produce their edible parts, be that fruit, leaves, vegetables or roots. In fact, forest gardens typically produce an abundance of food, meaning that you will have a surplus to preserve for the winter months or trade and distribute with your neighbors or through a market stall. With so much plant life in a forest garden, the leaf litter that inevitably falls to the ground serves as a natural compost. The abundance of plant material means that microorganisms and bacteria are supplied with a lot of nutrients and so quickly turn the leaves into compost and incorporate it into the topsoil. The shade and groundcover provided in a forest garden also helps to prevent soil erosion and limit the evaporation of water from the soil. With the great biodiversity in a forest garden attracting many species of insects, pest control occurs naturally. By providing a permanent home for lots of types of insect, the forest garden finds a sustainable level between predatory insects and those that eat plants. And the predatory insects are prevented from becoming too numerous by the birds and smaller animals that are attracted to the forest garden to feed on them. Nature again finds the right balance. In nature, forests exist and thrive perfectly well as their own closed system. They don’t need the addition of extra fertilizer, the removal of weeds, the spraying of pesticides and so on to keep them flourishing – they evolve and adapt to incorporate change. Forest gardens do the same thing, meaning that the human effort required to maintain them is minimal. Of course, permaculturists looking to initiate a forest garden will need to put some time into planting and working with the land (such as mulching, compositing and so on) to ensure the best start to the forest, but once the forest garden gets going, it requires very little maintenance. The systems of planting that go into a forest garden perpetuate a self-sustaining system, meaning that, from a mature forest garden, the permaculturists really only has to harvest!